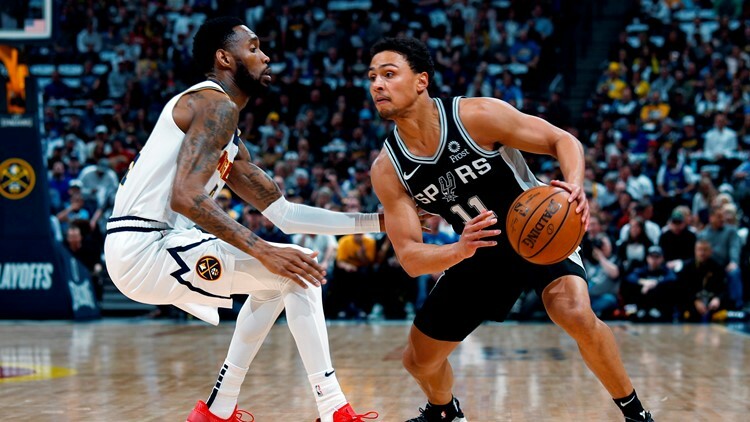 Spurs guard Bryn Forbes goes against Nuggets guard Will Barton in the first half of Game 3 of the San Antonio-Denver first-round playoff series Tuesday night in Denver. Sparked by guard Jamal Murray, who went off for 21 points on 8-of-9 shooting in the fourth quarter, Denver outscored the Silver and Black 39-23 in the final period to even the series. Game 3: Nuggets at Spurs, Thursday, 8 p.m.
Game 4: Nuggets at Spurs, Saturday, 4:30 p.m.
Guard Jamal Murray, who struggled in the first seven quarters of the Denver Nuggets' first-round playoff series against the Spurs, came alive in the fourth period of Game 2 Tuesday night. Boy, did he ever come alive. With Murray scoring 21 of his 24 points in the final quarter, the Nuggets roared back from a 19-point, third-quarter deficit to beat the Spurs 114-105 and even the series at a game apiece at the Pepsi Center in Denver. Murray hit 8 of 9 shots in the fourth period, and nailed back-to-back three-pointers that gave the Nuggets a 110-101 lead with 2:12 left. He finished 8 of 17 from the field, after going 0 of 8 from the field and scoring only three points through three quarters. Murray was a one-man wrecking crew in the final period, scoring 21 of Denver's last 33 points after hitting his first field goal with 10:46 remaining. He hit a floating jumper to put the Nuggets ahead to stay, 101-99, with 3:53 left. "Well, we gave up 38 points (actually, 39) in the fourth quarter. End of story," Popovich said, when he was asked about Murray's scoring outburst in the final period. "Tough to win a game on the road in the playoffs if you're going to give up 38 points. "Paul (Millsaps) and Jamal had a lot to do with that, obviously. They both hurt us badly. We didn't have any answers for either one of them." Millsaps, who finished with 20 points on 7-of-10 shooting, was one of four Nuggets players scoring at least 20 points. 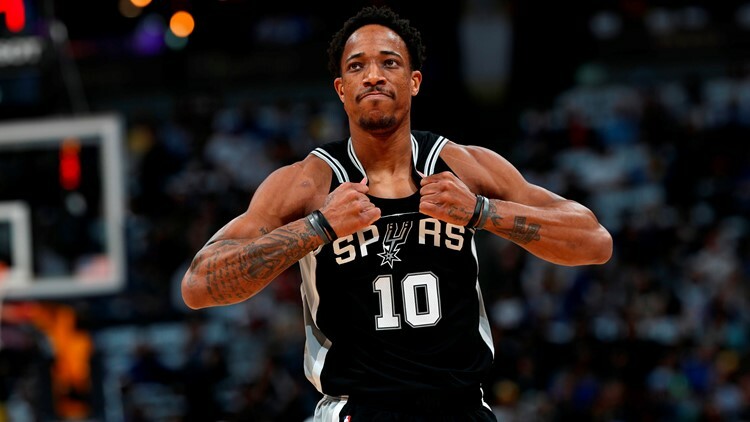 Guard DeMar DeRozan scored 31 points on 11-of-19 shooting in the Spurs' 114-105 loss to the Nuggets in Game 2 of their first-round playoff series Tuesday night in Denver. Denver's second-leading scorer during the regular season, Murray scored 17 points in Game 1, but was only 8 of 24 from the field, including 0 of 6 from the three-point line. He nailed 2 of 3 three pointers on Tuesday night. The next two games of the best-of-seven series will be played in San Antonio, with Game 3 set for 8 p.m. Thursday at the AT&T Center. The Silver and Black have won 13 consecutive games against Denver in San Antonio since March 4, 2012. Denver coach Michael Malone, who recorded his first NBA playoff victory, described Murray's fourth-quarter performance as "phenomenal." "Really proud of him," Malone said. "He was so frustrated at halftime, not making shots, shots that he's made his whole career. I just grabbed him. I said, 'Listen, take a deep breath. You're putting too much pressure on yourself. 'Every shot right now is like the end of the world. I believe in you. I love you. Just go out there and play.' And for him to go out there and he gets 24 points, 22 in the second half, and I'm not sure how many in the fourth quarter, was great to see after Game 1, after the first half." Ahead by 10 at the half, the Spurs took their second 19-point lead of the game on two free throws by Rudy Gay with 5:19 left in the third quarter. Undaunted, the Nuggets came roaring back, just as they did when San Antonio went on a 14-0 run to go ahead by 19 (42-23) with 8:28 left in the first half. Denver went on a 15-2 run, including 10-0 at one point, to cut the deficit to five points in the third quarter. But LaMarcus Aldridge scored the last two points of the third quarter on free throws, putting San Antonio up 82-75 heading into the final period. The Nuggets outscored the Silver and Black 26-23 in the third period, hitting 10 of 21 field-goal attempts. But Denver was just warming up, outscoring the Silver and Black 39-23 in the final quarter. 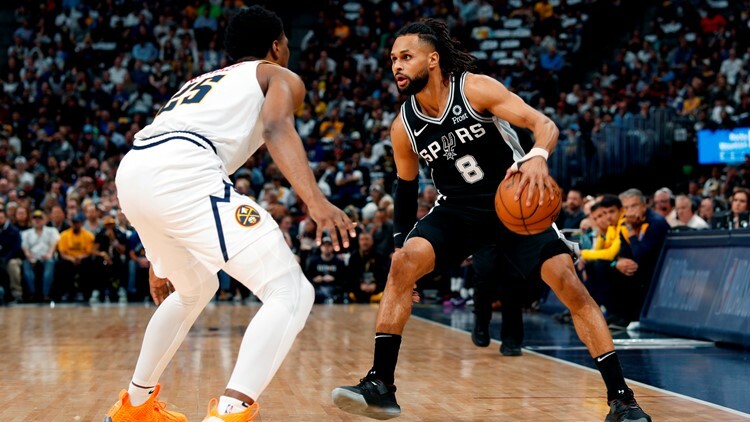 Patty Mills goes against Nuggets guard Malik Beasley in Game 2 of the San Antonio-Denver first-round playoff series Tuesday night at the Pepsi Center in Denver. Murray hit a jumper to tie the game at 95 with 6:04 left, but Aldridge responded with a bucket on the other end to put San Antonio up by two. It was the last time the Spurs led. Murray knocked down a jumper to tie the game again at 97, and gave the Nuggets their first lead since the first quarter (17-16) with the first of two made free throws. After DeRozan nailed a turnaround jumper to tie the score at 99, Murray scored on a floating jumper to put Denver ahead to stay with 3:53 left. He made it 102-99 when he sank a free throw after Popovich was whistled for the technical. Aldridge finished with 24 points and Derrick White added 17. DeRozan led the Spurs on the boards with seven rebounds and finished with two steals. Denver had two other players besides Murray and Millsap score at least 20 points. Gary Harris finished with 23, and Nikola Jokic had 21. Jokic just missed a triple-double for the second game in a row, adding 13 rebounds and eight assists. Monte Morris added 11 points and rounded out the Nuggets' double-figure scoring. Denver shot 48.3 percent from the field (43-89) and 41.7 percent (10-24) from the three-point line for the game. Harris nailed 3 of 6 shots from beyond the arc, and Jokic and Malik Beasley hit two each. The Spurs shot 45.3 percent overall (39-86) and 27.8 percent (5-18) from long distance. 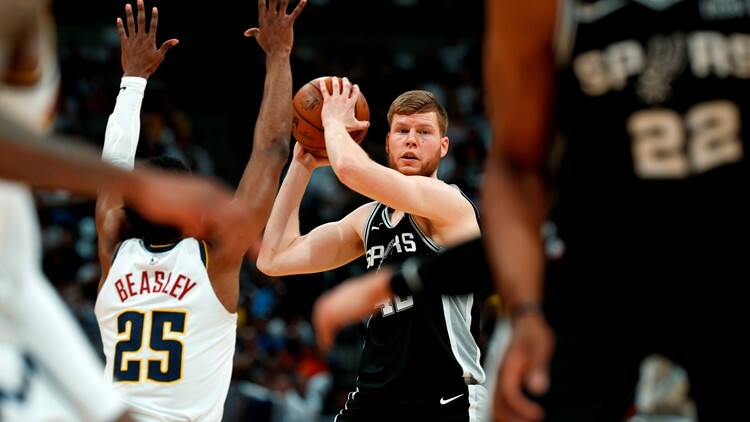 Spurs forward Davis Bertans keeps the ball away from Nuggets guard Malik Beasley as he looks to pass in Game 2 Tuesday night at the Pepsi Center in Denver. DeRozan (17) and Aldridge (16) combined for 33 points to lead the Spurs to a 59-49 lead at the half. San Antonio led by as many as 19 points in the second quarter before the Nuggets cut the deficit to six in the final three minutes of the period. But the Silver and Black outscored Denver 11-7 the rest of the half to end up ahead by 10 at the break. DeRozan scored 13 of his 17 first-half points in the second quarter. He sat out most of the first period after picking up two fouls in early going. White (13) also scored in double figures in the first half. He was 5 of 7 from the field, including 1 of 3 from the three-point line. S.A. shot 46.8 percent overall (22-47) and 30 percent (3-10) from beyond the arc. Millsap and Jokic led the Nuggets' first-half scoring with 15 and 12 points, respectively. Denver shot 38.3 percent (19-49) overall and 27.3 percent (3-11) from the three-point line. Murray, the Nuggets' second-leading scorer, continued to struggle offensively in the first half, scoring only two points on free throws. He was 0 of 6 from the field. DeRozan was asked how the Spurs felt leaving Denver with a split.